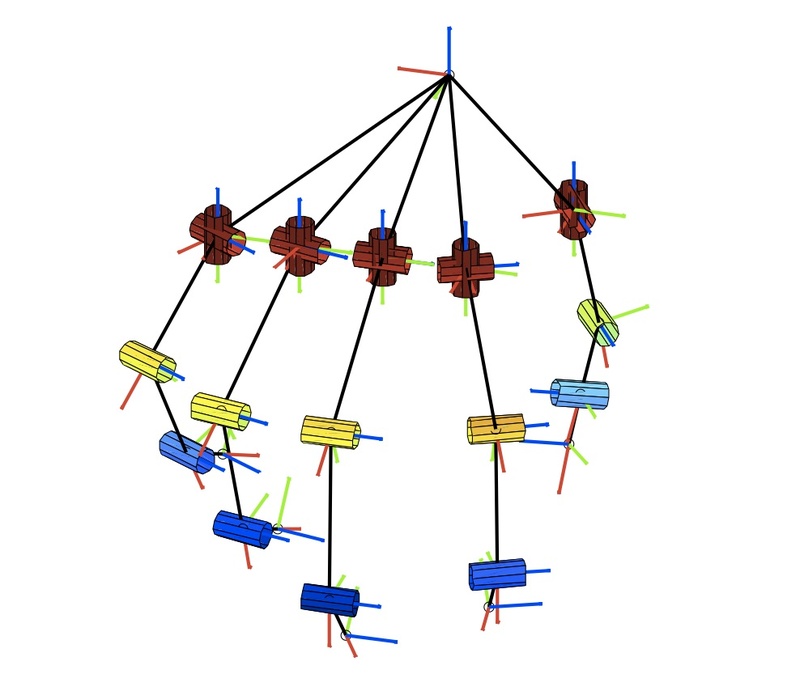 The model that is implemented in the Matlab script SGhuman24DoF.m has 24 degrees of freedom and is described in . The function can be downloaded clicking on the link below and can be simply added to the other hand models available in SynGrasp. - 2 for the trapeziometacarpal (TM) joint (twist, adduction/abduction). - 1 for the CMC joint (flexion/extension). S. Cobos, M. Ferre, M. A. Sánchez-Urán, J. Ortego and R. Aracil. Human hand descriptions and gesture recognition for object manipulation. Computer Methods in Biomechanics and Biomedical Engineering , Vol. 13, No. 3, pp. 305 – 317, 2009. M. Malvezzi, G. Gioioso, G. Salvietti, D. Prattichizzo, A. Bicchi. 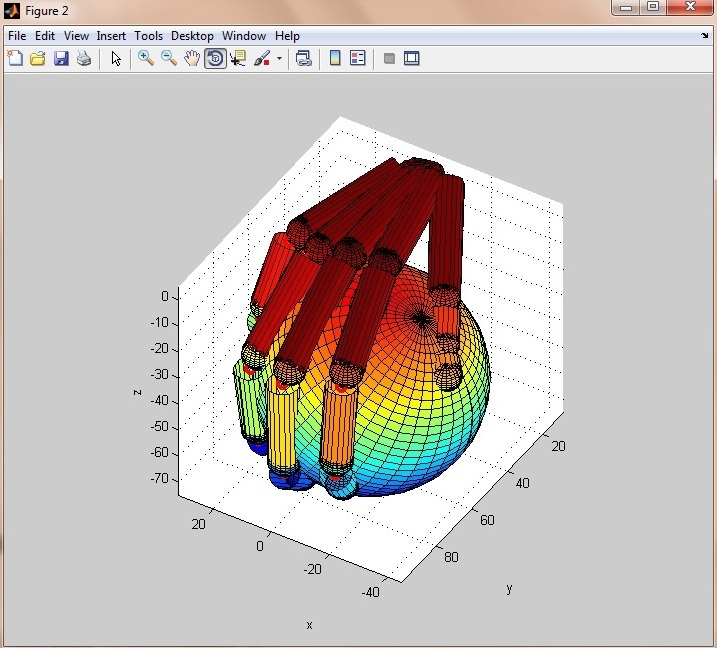 SynGrasp: a MATLAB Toolbox for Grasp Analysis of Human and Robotic Hands. In Proc. IEEE Int. Conf. on Robotics and Automation, Karlsruhe, Germany, 2013. This version includes substantial variations of the file organisation. Several examples have been added including human synergies mapping onto robotic hand with different kinematics, evaluation of human hand writing and a grasp planner. 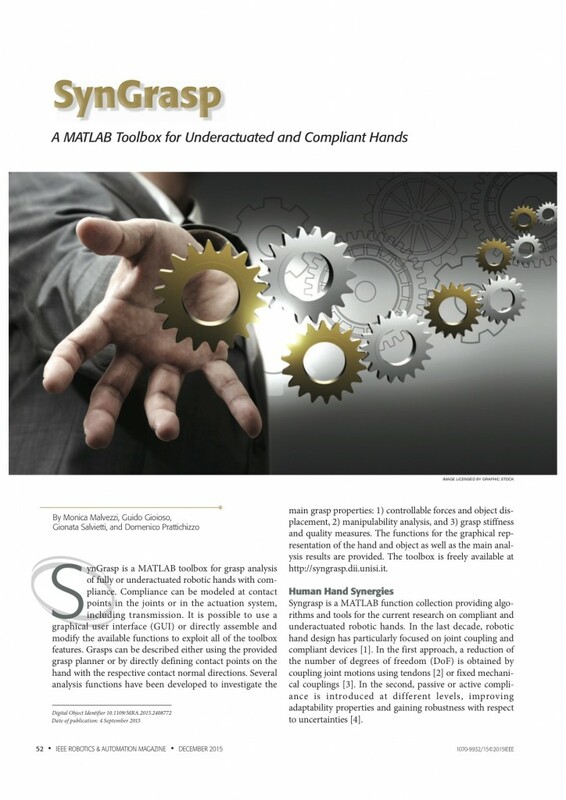 This version consents to use a GUI to interact with the toolbox hand models and functionalities. The new User guide will be available soon. The paper “SynGrasp: a MATLAB Toolbox for Grasp Analysis of Human and Robotic Hands” has been accepted for publication at the 2013 IEEE International Conference on Robotics and Automation. The toolbox will be therefore presented in Karlsruhe on May 6-10. New Version Available.. little bug fixed! We found that using SynGrasp with different Matlab versions could lead to different results obtained by the same toolbox functions. We fixed this problem in this new subversion of the toolbox. We found some wrong instructions in the “help” of some functions due to the overlap of different toolbox versions. We fixed them and now the version SynGrasp1.2 that you can download from the link below (last post) should be ok from this point of view. We will appreciate your … help. In this version of toolbox some bugs were fixed and the “help” of most of the functions have been updated. The SynGrasp User Guide is also online.